The Lotus is a highly-revered flower in Buddhism, legend has it that where ever Buddha went Lotus plants would grow, he must have traveled a lot as they seem to be every where, from small ponds in out of the way places, to lakes in much traveled areas, you will also find Lotus flowers in most Buddhist temples, also in murals and basically any art work. It often symbolises rising from the dirty muddy waters and bringing about a beautiful perfect flower. The lotus is edible, all of it that is, different parts of the plant have different attributes including medicinal, but we aren't going to eat ours so stick to the local drug store for now. 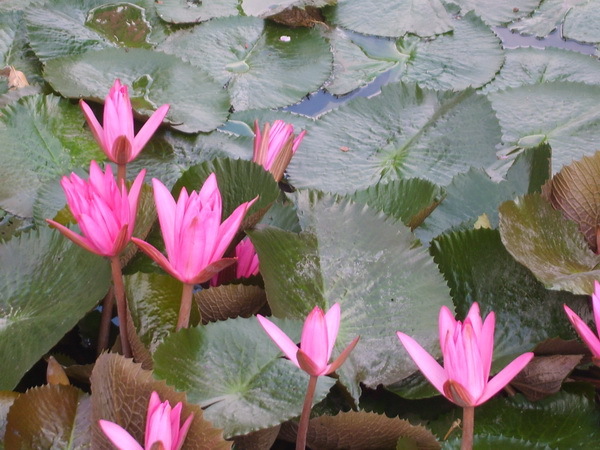 If you visit Pathum Thani a trip to the Lotus Museum maybe of interest. Founded in 2000 as a project of Princess Maha Chakri Sirindhorn to collect lotus species both Thai, foreign and hybrid, this museum is a research and learning center. 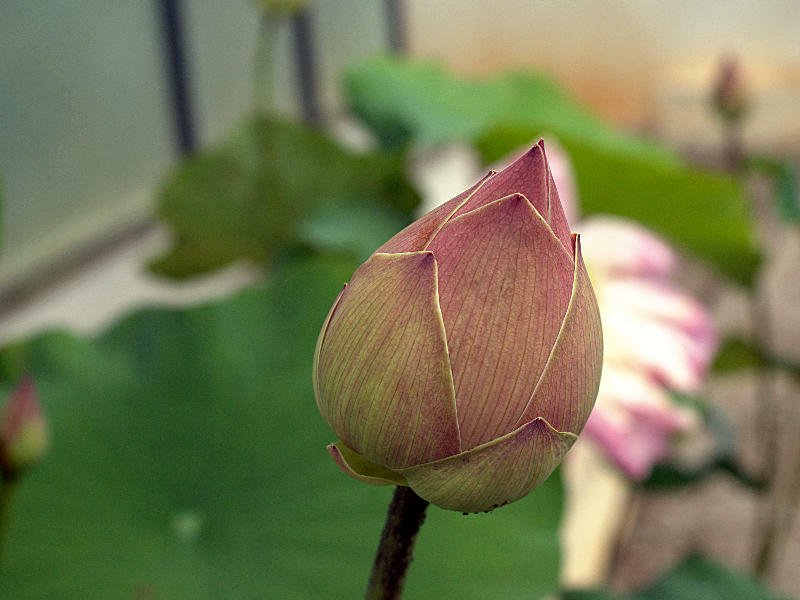 Lotus (Nelumbo) is one of the most majestic plants to have in a water garden. It is by far the most exotic of all pond plants. And it is the one plant that scares water gardeners. Quite a few people tend to shy away from them, and are intimidated by them. NO NEED! They are very easy to grow once you understand the basic care of them. The colors available are white, yellow, pink, and even bi-color. 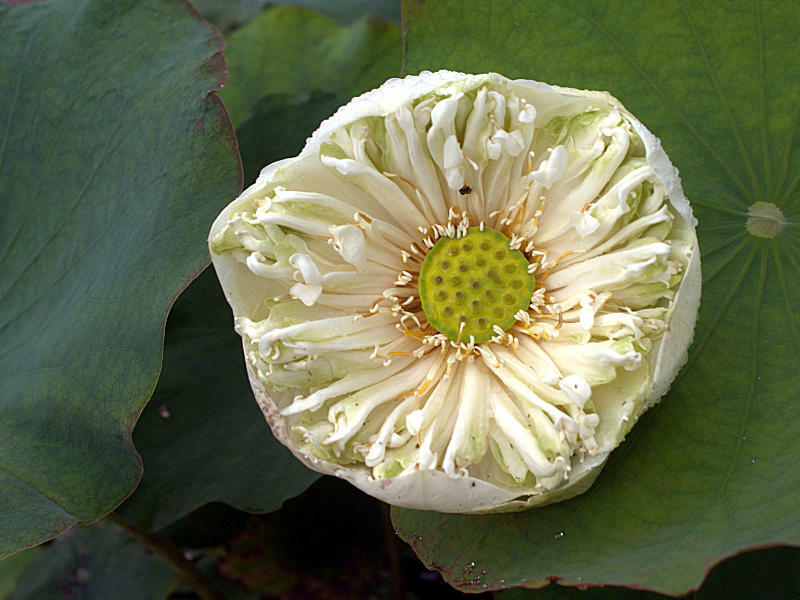 The blooming period is usually in late summer in colder climates because Lotus love the heat. They are very fragrant and the perfume will permeate the evening air. The flowers, which last 3 to 5 days, close up at night. Most florists and craft people love the dried Lotus pods because of their uniqueness in fresh and dried arrangements. The seeds that dry in the pods will rattle when shaken. It is reported that the seeds remain viable for centuries! They are reports that folks were able to germinate lotus seeds left in the tombs of the pharaohs after 3,000 years. Lotus are hardy from zones 5 to 10 and there are some varieties that are hardy to zone 4 so be sure to check the zone hardiness of the variety that you are purchasing. Sun requirements are at least 6 hours a day. They will not bloom well in 6 hours but they will grow. To bloom well they need full all day sun. The most important factor is sun. The height will vary from 18 to 60" depending on the variety. Ideally they like 4 to 10" of water over the pot. I start out in the spring at a shallow depth of a couple of inches over the rim of the pan. This shallow depth will be warmer too. As new growth begins to sprout the pan can be gradually lowered to a deeper depth, but no deeper than 10 inches, if need be. Lotus is planted in pans (large and shallower than a pot). The pan should be at least 13" x 9", but larger is much more preferred. In a pinch a kitty litter pan works great. To the pan add half a mixture of garden soil and half of commercially prepared topsoil so the pan has about 4 inches of soil. Also the pan will warm up faster than a deep pot. Warmth is essential. One trick if you keep your house on the cool side is to set the pan on a heating pad that is set to "low". Then the tuber arrives it should be dormant. Handle the tuber carefully so you do not break off the growing tip, called an “eye”. The eye is described as the part of the tuber where the leaves will grow from. You should be able to detect a spot on the tuber where leaves, not roots, were once growing. This eye must not be covered with either soil or gravel. Lay the tuber horizontally on the soil with the eye sticking up so it will protrude from the soil and gravel and cover with dirt. Before covering the tuber with the dirt, place a large flat stone on the tuber to help keep it weighted down and to keep the fish from bothering the tuber. The tubers have a tendency to float out of the dirt until the roots have developed. Push a couple of pond tablet fertilizer tablets in the soil near the outer rim of the pans. Finally add a couple of inches of pea gravel on top of the dirt. Set the pan in a sunny area and add a couple of inches of water to the pan. Once you see leaves coming up then you can add more water. This little trick will also help keep the tuber from floating out of the pan. OR you can add the plant to the pond if the water is warm so that no more than a couple of inches are over the top of the pan. Lower the pan a couple of inches every few days. TIP: Upside down clay pots are very useful and can be stacked until you get the depth you want. NOTE: You do not need to purchase special prepared pond soil. Save your money for more plants! Wondering what I mean by ordinary garden soil? It is any soil that will grow plants. Go out and dig up some soil where you have a vegetable garden or flowerbed. If it is good enough to grow garden plants, it is good enough for pond plants! And if it is clay based that is even better. The lotus will be slow growing at first. Then the leaves will start to come once the tuber has rooted. The warmer the room where they are starting, the quicker the leaves appear. Even if you keep your house at 72 the dirt will only be in the 60's and that is too low for the tuber to break dormancy. We start a new crop every year in February in the greenhouse. The temperature in the greenhouse will range from 80 to the upper 90's depending on the air temperature out side and how much sun we are getting that day. In about 10 days in the 80 to 90 degree temperature we have leaves in 7 to 14 days. So if you are keeping the tuber too cold it may rot before it roots! Note the bucket of lotus flowers sat next to the monk in white robes.